On stage at the second annual WSJD Live conference on Monday, Apple CEO Tim Cook revealed Apple Music now has more than 15 million users, including 6.5 million in the paid tier, but stayed mum on Apple Watch sales numbers and a rumored car project. 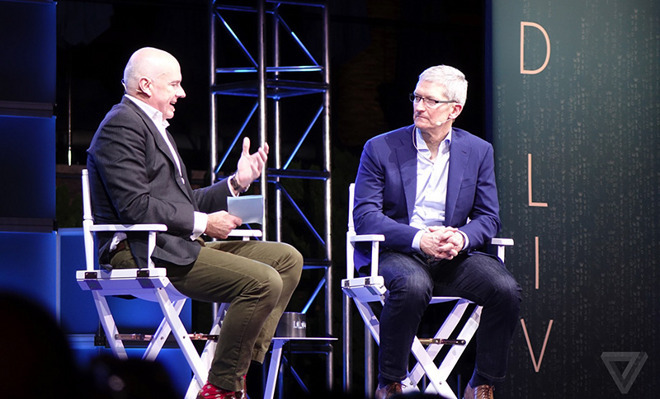 The interview started out slow with Wall Street Journal editor Gerard Baker trying to pry some Apple Watch data out of Cook, who has been expectedly tight-lipped about sales performance and plans for next-generation hardware. Cook did answer a question pertaining to Apple Music, however, saying the fledgling streaming service now has 6.5 million paying subscribers and another 8.5 million trying it out for free. As noted by The Verge, Cook once again touted Music's human curation features and ability to surface new and interesting tunes on a per-user basis. "It's going really well," Cook said. "Fortunately, lots of people are liking it." Cook carefully talked around Apple Car rumors, saying that with the incorporation of more powerful software like autonomous driving and electric propulsion, the automotive industry is in for "massive change." Still, Cook was not prepared to offer insight into Apple's supposed plans. "As we look at it, what we really want in the hopefully in the short term is, we'd like people as they enter their car to have an iPhone experience in their car," he said. Regarding iPhone, Cook said Apple's new iPhone Upgrade Plan is designed for owners who want to update their smartphone every year, and should not be considered an attempt to undermine partner carrier sales. Under the plan, customers pay Apple monthly fee —starting at $32 per month for carrier unlocked versions —to receive a new iPhone with AppleCare+ each year, after trading in their old handset. Cook again reiterated that data privacy is a huge concern for his company, saying, "We think encryption is a must in today's world. No back door is a must." The statement is in response to overtures from the U.S. government to create a backdoor policy that would allow sanctioned law enforcement bodies access to sensitive user data stored on Apple's servers. Cook has long been a staunch opponent of such practices, including customer tracking programs other tech companies use to deliver personalized services and advertisements. On social responsibility, Cook is adamant that Apple should leave the world a better place than they found it. To Apple, this includes diversifying the workplace, bolstering the nation's education system and decreasing impact on the environment. "Steve [Jobs] formed Apple to change the world," he said. "This was his vision. He wanted to give technology down to everyone and empower everyone to use it. He wanted to take it out of the glass house, the corporations, the rich people that had the technology. [...] That is still our drive." Baker followed up by asking if that line of thinking alienates Apple's current clientele. "If we piss a few people off, at least they'll say, 'They made a great product, and I may not agree with this or that, but I respect that they're trying to leave the world better than they found it.' At least, that's what I hope they'll say," Cook said. It was reported that Cook planned to fly to Beijing after the interview, where Apple plans to have 40 Apple Stores in operation by the end of 2015. Currently, the region accounts for roughly 20 percent of Apple's bottom line. This is Cook's second appearance at WSJD live. During last year's inaugural conference he explained why Apple could no longer manufacture iPod classic, revealed Apple Watch battery life expectations and addressed concerns regarding Apple Pay adoption.